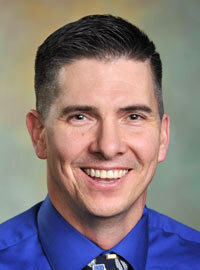 Chris Padilla is a training manager with UGPTI's Bismarck office. Chris works with the Transportation Learning Network (TLN), ND Local Technical Assistance Program (ND LTAP) and NDDOT Transportation Innovation Program (TRIP). Chris collaborates with the TLN members to develop and identify technology transfer presentations, including research projects from the MPC program. Chris also develops the monthly Safety Talk newsletter that is sent to all local agencies, consultants and contractors. Chris is always ready and willing to help out with anything wellness related and often shares ways to improve wellness with his co-workers. Chris spent 13 years with the NDDOT prior to coming to UGPTI. While at the NDDOT, Chris worked in the Design, Planning & Programming, Maintenance, and Construction divisions. Chris was responsible for the development and implementation of the NDDOT Maintenance Academy and the NDDOT Rotational Training Program. Prior to working for the NDDOT, Chris worked at the Pennsylvania DOT as a construction inspector for three years. Chris is a US Army active-duty veteran, where he served our great country for five years. Chris, his wife Gina, and their two children reside in Menoken, ND.